Our CREATIVE CUSHIONING is available in several variations. For strength & longevity, attachable seat & back cushions are manufactured with a wood base. We use a high-density, 2" polyurethane foam which is then upholstered with a grade A fabric. This fabric has a rubberized backing to protect the foam from moisture and is cleanable with soap and water. Fabric can also be optionally Teflon Coated. Lay in Waterfall Seat Cushions, Reversible, Waterfall Welts, and Buttons Shown at the right. 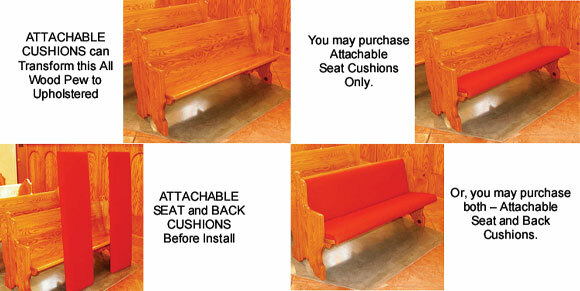 Easily add comfort to your existing all wood pews. Give the look of permanence. These Cushions are designed to give the look a factory upholstered pew. Back Cushions can also be added, to make a fully upholstered pew. 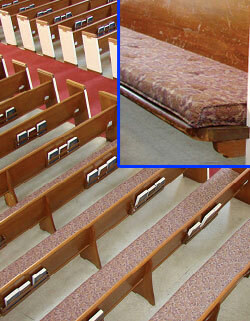 The pews shown below demonstrate how our Attachable Cushions function. 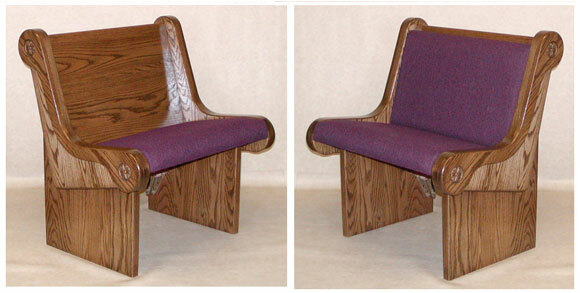 These Seat and Back Cushions are designed to emulate a fully upholstered pew. They have their own structural back bone. Our "attachable" cushions do not damage the exsisting pew body. It can be removed in future years if you want to revert to your all wood prews. Reversible seat cushions are also available. 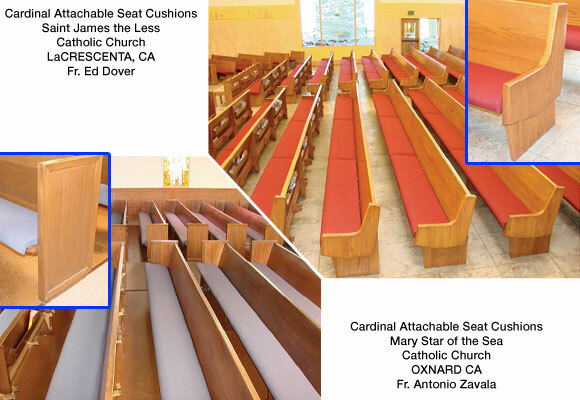 Cardinal Church Furniture Craftsmen can easily convert your existing ALL WOOD Pews to Upholstered Seat Pews or to a FULLY UPHOLSTERED Seat and Back Pew. Call Cardinal at 1-800-334-7611 for more information.